The holiday is based in the charming Spanish resort of Callela de la Costa, which lies on a beautiful stretch of coastline just north of Barcelona, hence the name. The walking will be hard to beat if you are looking for variety: we will walk along the region’s beautiful and rugged coastline, as well as inland through the spectacular Montserrat Natural Park. 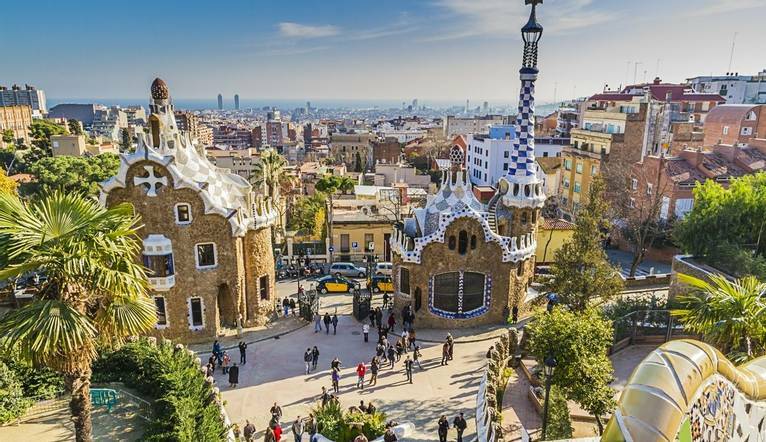 In addition, there will be time, if you wish to visit 2 of the region’s finest cities, Barcelona and Girona, as both are easily accessible by public transport from our hotel. This loop walk will take as along the beautiful and rugged Costa Brava coastline with spectacular views of the Meditteranean to enjoy. We will pass through the famous town of Tossa de Mar – a charming, picturesque walled town which originates from the middle ages, and is rich in heritage; the Villa Vella (old quarter) still has its ancient defensive walls and towers intact. Known as “the Blue Paradise” Tossa has long appealed to artists because of the sheer beauty of its landscapes, as well as its wonderful light. Hike to one of the most important peaks of Iberian Peninusla and the highest of Montseny, an important Catalan pre-coastal mountain range and UNESCO designated biosphere reserve, the only one in Catalonia. This walk will take us into the Montserrat National Mountain range, from where will see the spectacular views of the stunning Benedictine Monk retreat high in the mountains that this area is famous for. We will also see some amazing rock formations, as we take the funicular up to the top of the mountain for the best views of the surrounding stunning Catalonian landscapes. Our hotel is ideally located just minutes away from the resort centre of Calella and within walking distance of the beach. Facilities include a restaurant, 2 bars, swimming pool, jacuzzi, spa (additional charges), and fitness room. All rooms are tastefully decorated and include air-conditioning, satellite TV, hairdryer, safe (extra charge) and Wi-Fi (extra charge). The transfer time from Barcelona Airport to the Hotel is approximately 1 hour, depending on weather and traffic. Four guided walks are included in the programme. Your walking guide will advise you in resort of the daily programme. The walking programme is graded as Easy to Medium and you can expect to walk between 7.5 to 12km per day, with some ascents/descents, rough underfoot terrain and high altitudes involved. There will be several optional activities available to you during the course of your holiday, full details of which will be given out at your Information Meeting by your Tour Leader. Listed below are a few of the tours, together with prices, which should be used as a guideline. All tours should be paid for in euros only. The exact amount will be given at your Information Meeting. Your Tour Leader will help arrange these for you but may not necessarily accompany you. Day Trip to Girona or Barcelona - both these cities can be accessed via local public transport - full details will be given in resort. We suggest a Group Collection to cover transfer drivers, and hotel staff of €20 per person. Your Tour Leader will collect this on your behalf and distribute it accordingly, thus relieving you of the burden of who, when and how much to tip. The tipping of housekeeping will be left to your individual discretion (a small amount left in your room on departure should cover this and would be much appreciated). As is customary, ‘the hat’ will be passed around for the driver and guide on all optional excursions. For any meals that are not included in your itinerary, or taxi fares, your Tour Leader can advise of an appropriate Ͽo add on.